Here are a few items and photographs from the Muskie Archives and Special Collections Library, items discovered elsewhere on campus — and beyond. “Fast and furious and marked by many swinging sticks,” wrote The Bates Student in its report on the first game of the 1927 hockey season, a Jan. 5 scrimmage between Bates and the Brunswick Cabots, a club team sponsored by that town’s cotton textile mill. 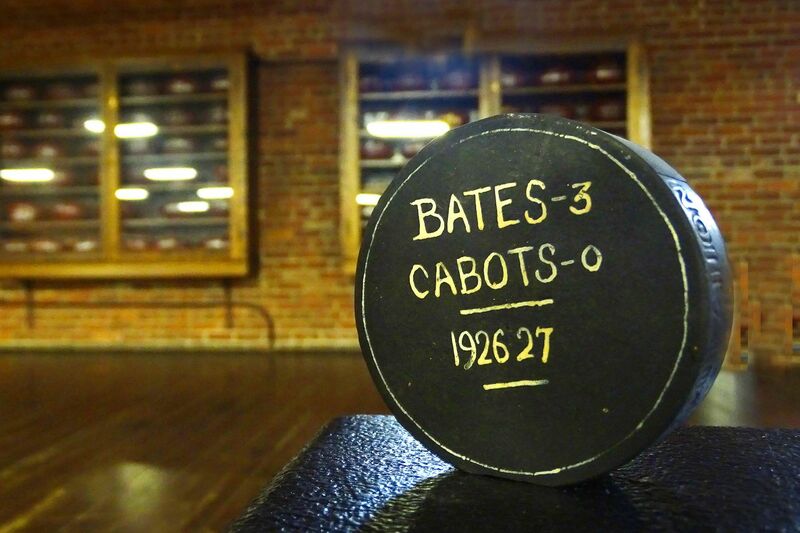 As noted on this inscribed puck (part of an assortment of historical sports items in Alumni Gymnasium) the game was a 3–0 win for Bates. The account doesn’t say where the game was played, but perhaps it was on the college’s first official hockey rink, which would become Lake Andrews. From the story, we know the surnames of the Cabots’ starting lineup, and they reflect the French Canadian workforce that once dominated Maine’s mills: Normand, Lamarre, Turcotte, Turcotte, Turcotte, and Turcotte. A century ago, postal carrier George Faunce delivered all Bates mail to campus. 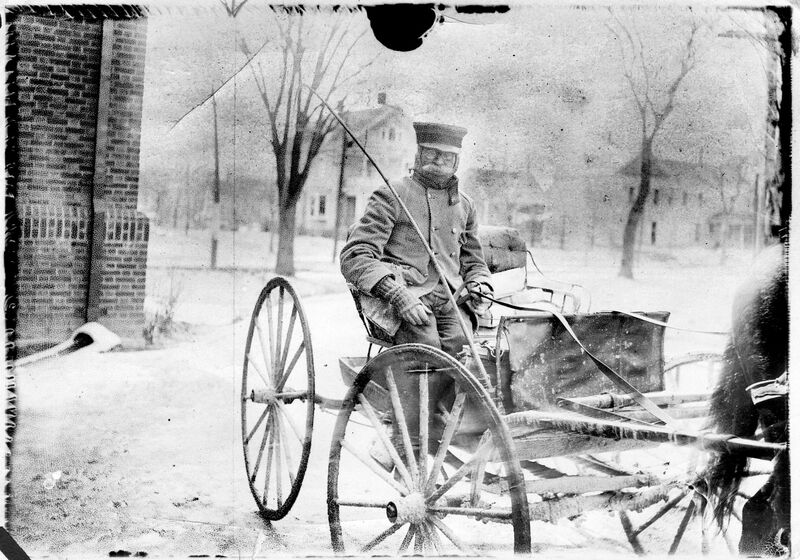 He had the college mail route from 1891 to 1922, the last 17 as a mounted carrier driving this horse-drawn wagon. When he retired, he’d delivered 6,578,692 pieces of college mail, according to the March 1923 issue of the Bates Alumnus, citing “college mathematicians” as the source. 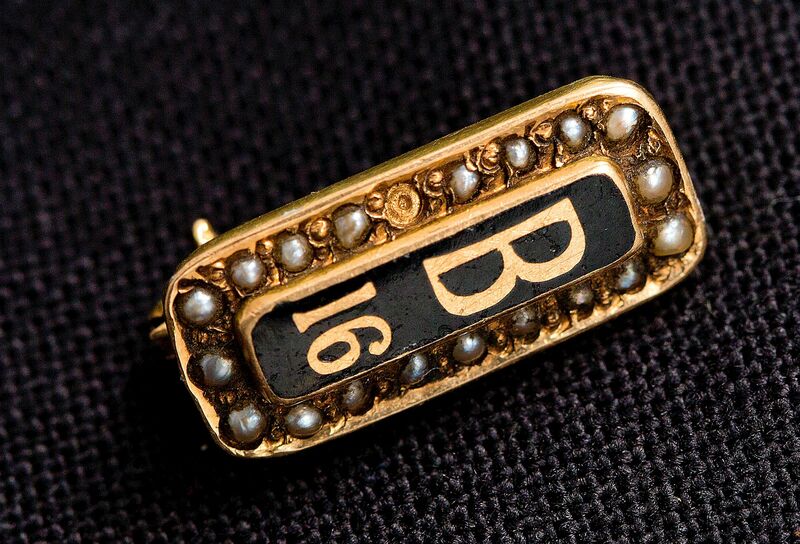 Graduates of the Class of ’16 — that’s 1916 — could purchase a garnet- and gold-colored class pin. This one belonged to Bernice Hood Greenlaw ’16. An educator who raised a family in Norway, Maine, she served as president of the Maine Teachers Association. 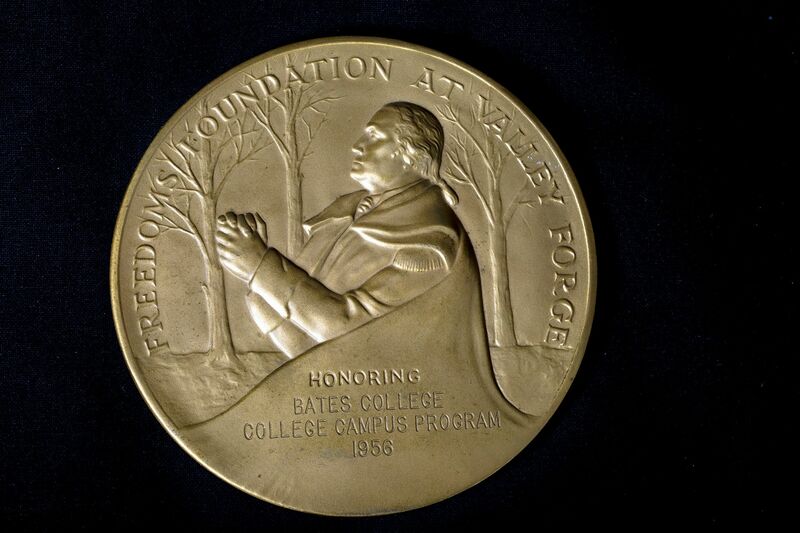 The Freedoms Foundation awarded this medal, about the size of a CD, to Bates in 1956 for efforts to make citizenship education part of the Bates curriculum. The program, which continued into the 1960s, welcomed a multitude of guest speakers from all areas of public life, including labor leaders, members of Congress, district attorneys, city managers, tax assessors, state legislators, academics, newspaper reporters, and citizen activists.